I’ve done a lot of trial and error when it comes to working out how to produce lettery videos for social media. Below is a list and explanation of the products I use now, or have used in the past. A note on the links included in this post: the Ebay links are to the Australian version of Ebay, and are my suggestions for purchasing if you are in Australia. It’s likely you could find similar on Ebay.com as well, but I’ve also provided Amazon links for those not in Australia. The Amazon links are affiliate links, which means I earn a small commission if you purchase via those links. You can buy similar products in many places, but I have found that Ebay and Amazon are often cheapest. I record all of my videos on my iPhone XS Max. I also have an Olympus OM-D E-M10, however am happier with the results from my iPhone. I have a few different tripods. 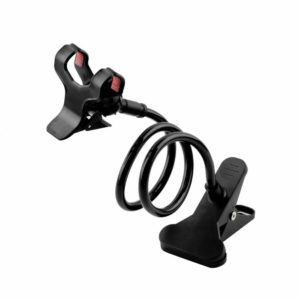 This is particularly great for low angle shots and for travel. I also sometimes wrap it around the top of my big tripod (below) if I need to attach my phone to it for a top-view. These are available in many places now, if you’re in Australia you can pick one up from Officeworks or Kmart for $10 or less. 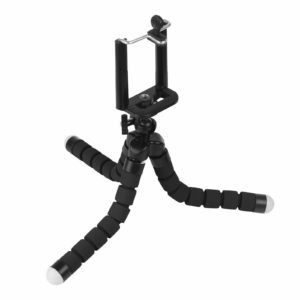 But they’re also available online, Amazon or Ebay, or just search “iPhone tripod”. This is great for top-view videos. I don’t currently have one of these as my most recent one broke, they’re not a particularly robust product, but they’re not expensive either so I didn’t expect them to be. The downside of these is that any small movement on the table can cause the phone to wobble – a lot, and for a while – which is visible in the video. I found it was better to have it attached to to something other than my desk when I was using it, eg. a bookshelf beside my desk. Again, they’re available on Amazon or Ebay, or search “iPhone flexible arm”. 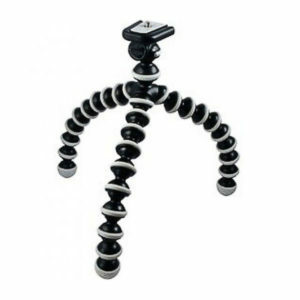 Similar to the first tripod above, this is great for low angle videos and travelling. These are also available on Amazon (this is the original, and most well-known brand available, there is a cheaper version here ) or Ebay, or from many camera stores. This is the tripod I use most often for top-view videos as it has the capability for the arm to be horizontal. It is a Vanguard Alta Pro 263AB with SBH 100 Ball head. 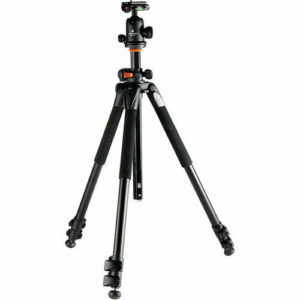 Manfrotto also produce a tripod with a horizontal arm, but they are more expensive. I purchased mine here, but if you’re not in Australia, it’s available on Amazon . Having a consistent light source makes a huge difference when it comes to making lettery videos. Otherwise you’re stuck chasing the light and trying to find a way to get adequate natural light but still be able to actually do the lettering (I made some of my earliest videos on the ground outside my house, it was awkward and painful!). 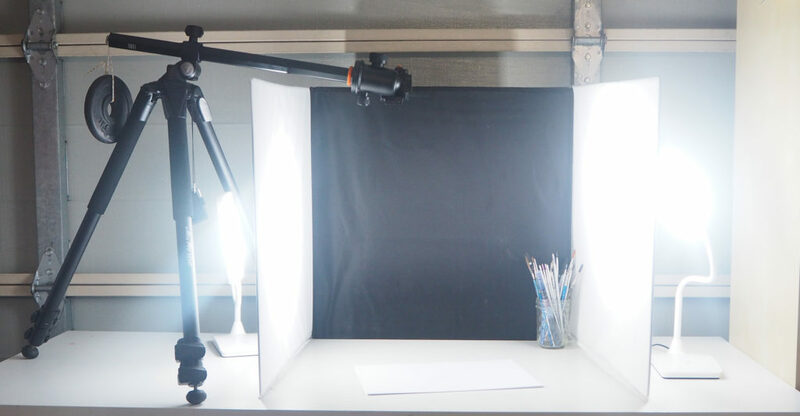 Up until recently I was using a light cube that I purchased on eBay, similar to this one, in the 50cm (20″) size (also available on Amazon here). However, I hacked it a little to suit my purposes, and didn’t use the lights that were included, instead using two of these lamps from Bunnings. I had all of this setup on a standing desk, to help keep open pots of ink and expensive cameras away from toddler fingers. 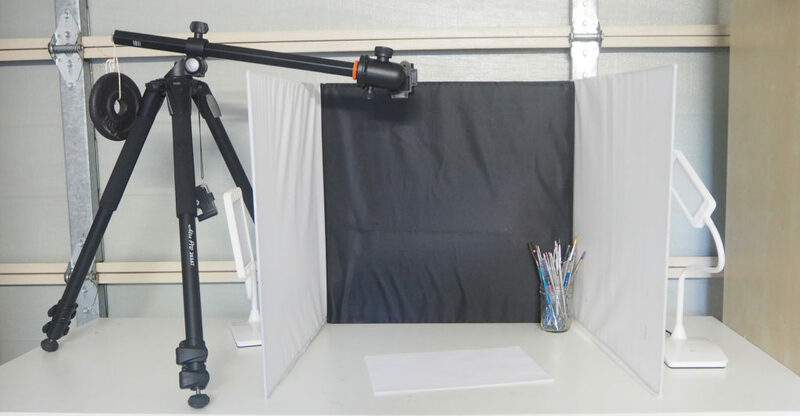 More recently, I’ve stopped using the lightbox, instead using two standing lamps like these ones from eBay, or here on Amazon .